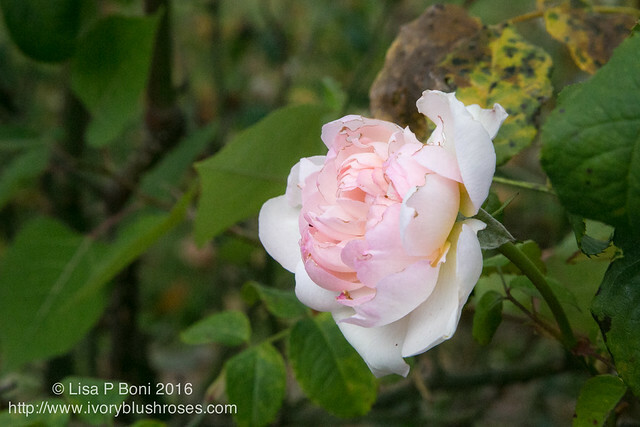 On Halloween, I had time for a look around the yard and gardens. It has been an exceptionally mild autumn, without a true hard freeze yet, though we have had very light frost on just a couple of mornings. 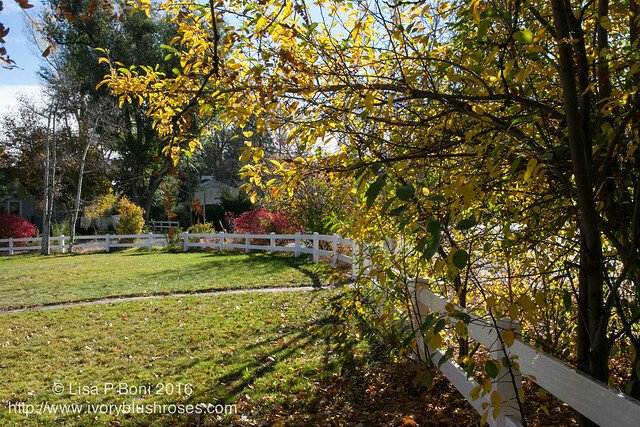 Things have been slowly progressing through the season and the leaves have been beautiful. 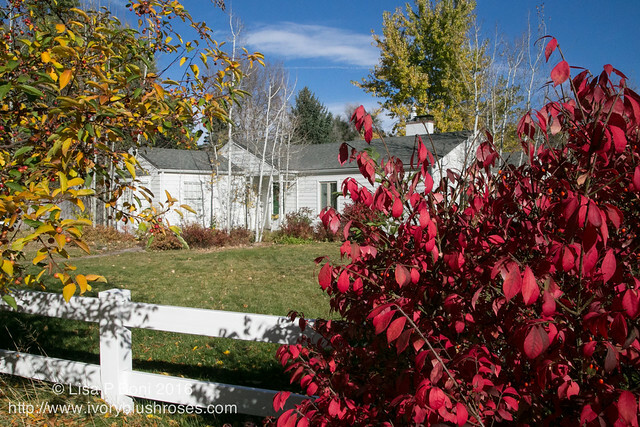 The aspen trees lost their leaves over a week ago, but the burning bush and the crabapple trees still sport lovely changing leaves! Love the warm colors of the landscape. I struggle with taking care of my yard due to the size of it at times, but it is lovely and I'm so grateful to have this peaceful oasis in the midst of the city! 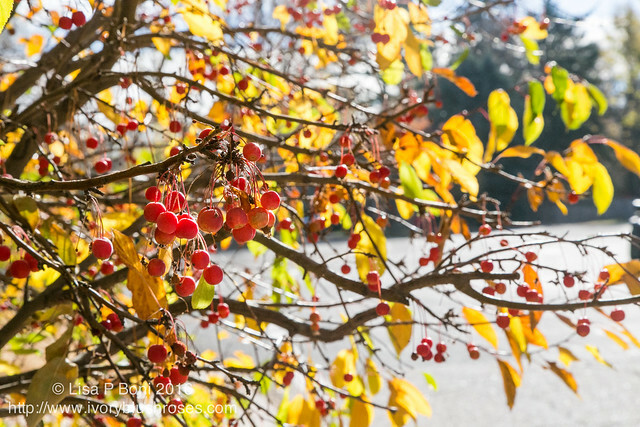 Crabapple fruits hang like jewels upon the branches. 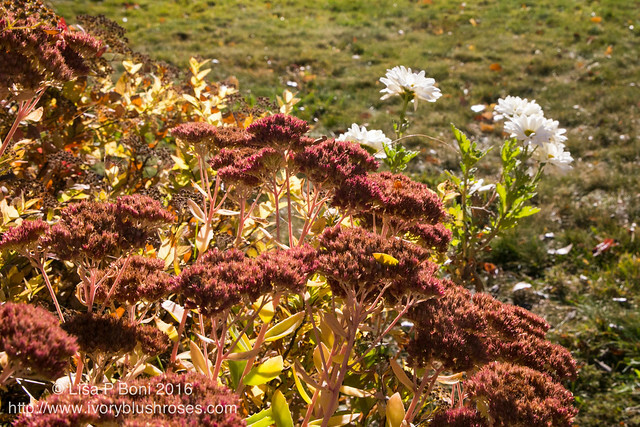 The Autumn Sedum heads have faded to a lovely russet and a mum still blooms even at this late date! 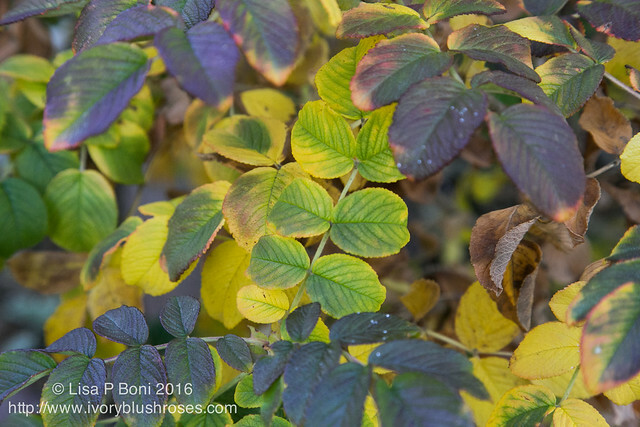 Leaves on the Rugosa Rose have turned an astonishing variety of colors! 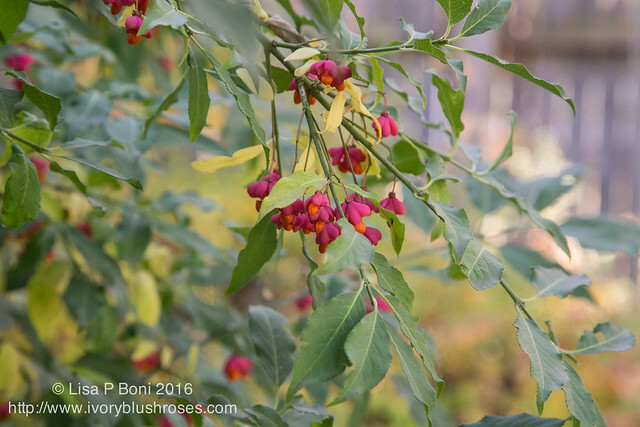 The Spindle bush, or Bishops Cap shrub is laden with fuchsia and orange fruits. 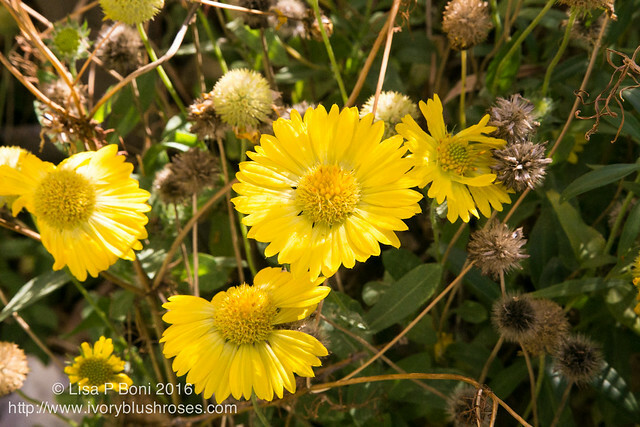 Nondescript the rest of the year, it is spectacular in this season of change! 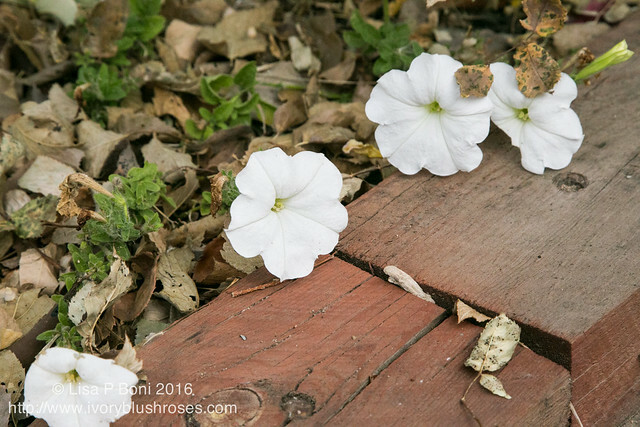 Around the flower beds, a few petunias are still blooming as they creep out from underneath the fallen leaves. 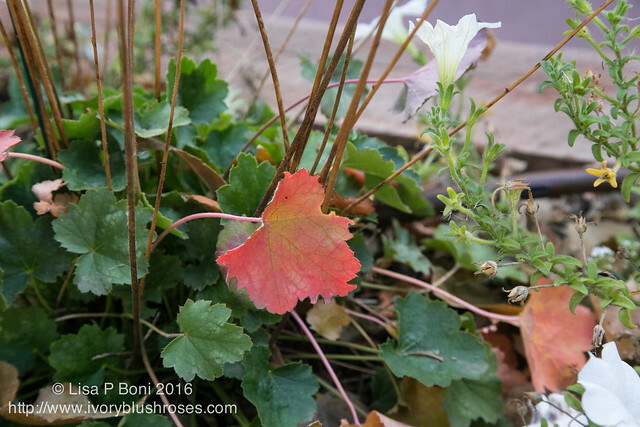 The Coral Bells are sporting scarlet leaves, one by one. 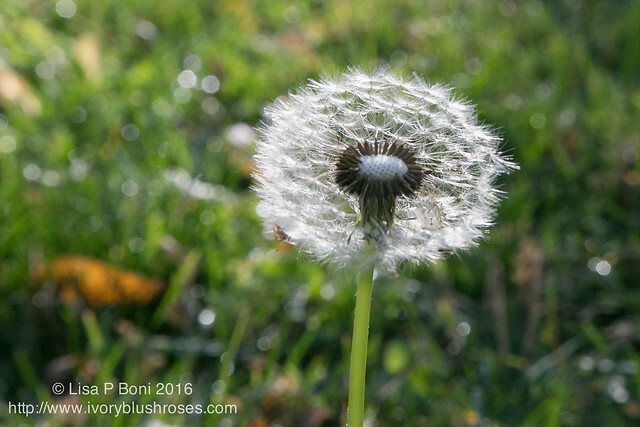 In the grass, a dandelion spreads it's glory ~ much to my neighbor's chagrin, I am sure. But I do love the variety of birds and bees that frequent my yard as a result of my not laying a thick coating of pesticides and herbicides down. 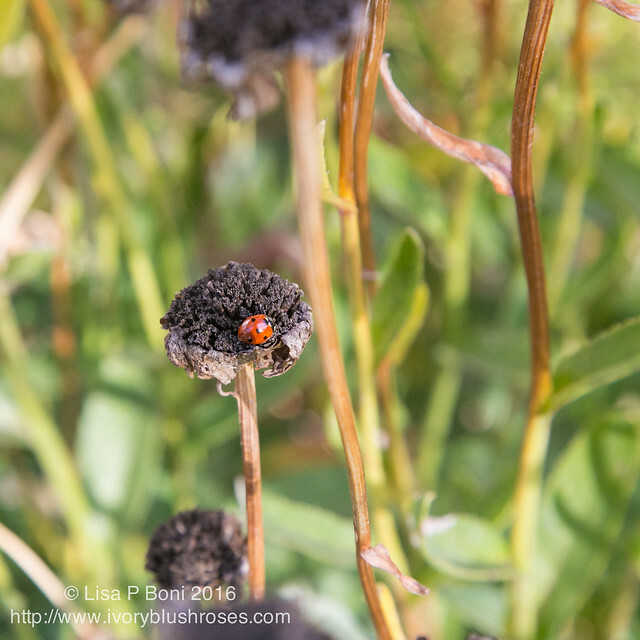 There are still ladybugs to be found in the flower garden. And Whirling Butterflies (Guara) still blooms. 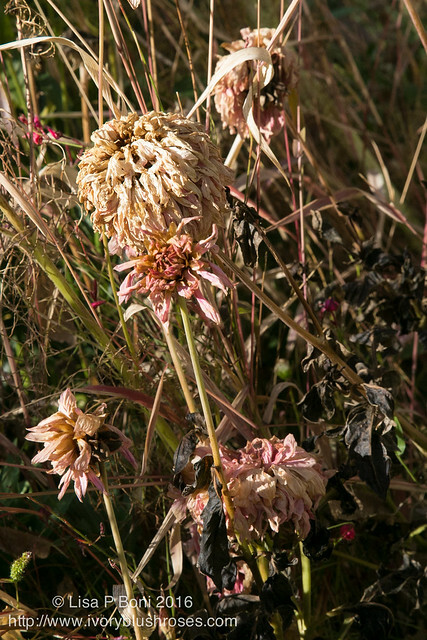 While other flowers such as these dahlias have faded away to a rustic end. 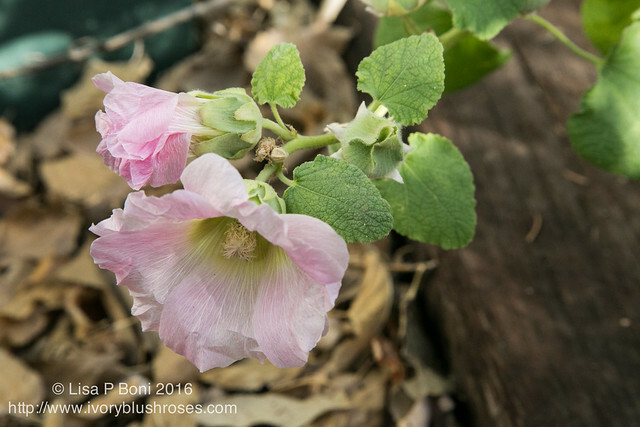 and much to my delight, the hollyhocks! 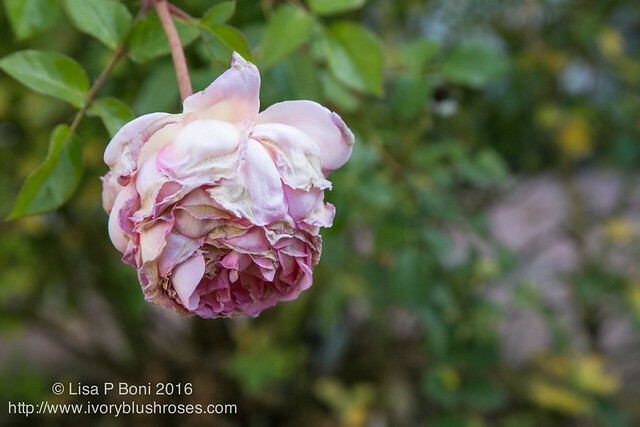 But what amazes me most is how many roses are still blooming, though they gradually are fading away. The petals tinged with autumns touch. 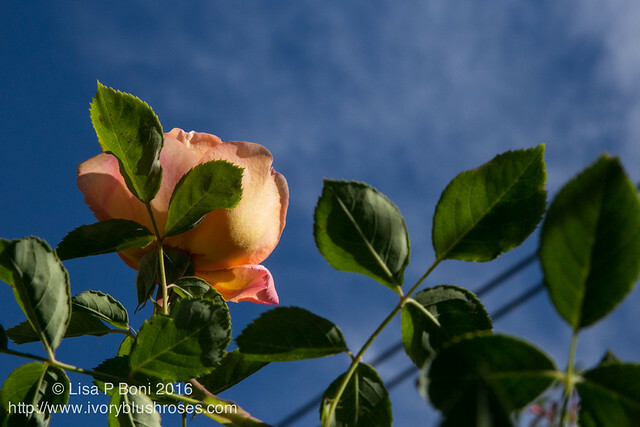 A perfect Halloween rose against an impossibly blue October day... which lingers on into November now. 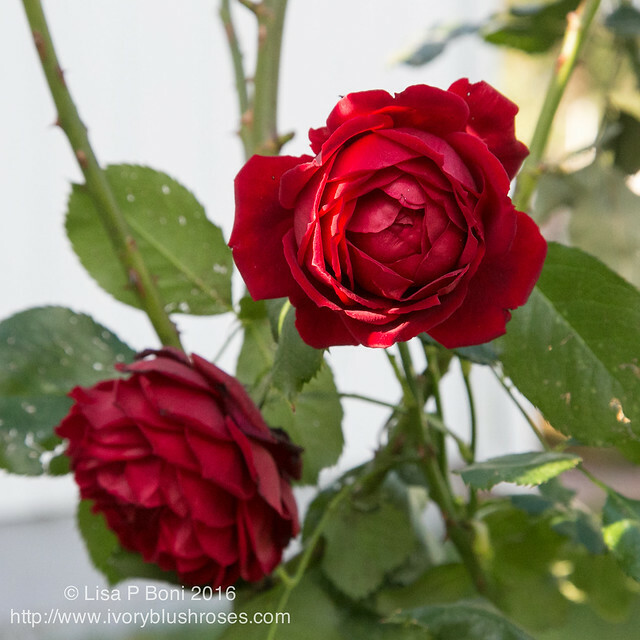 And rounding the corner of the house, I realized that a much neglected rose is bearing perfect scarlet blossoms. 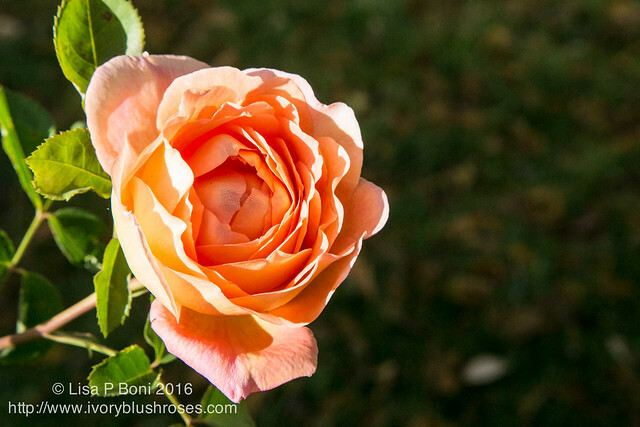 But who knew, that I, who generally dislikes the color orange, would find these spectacular apricot orange roses to be my favorite! 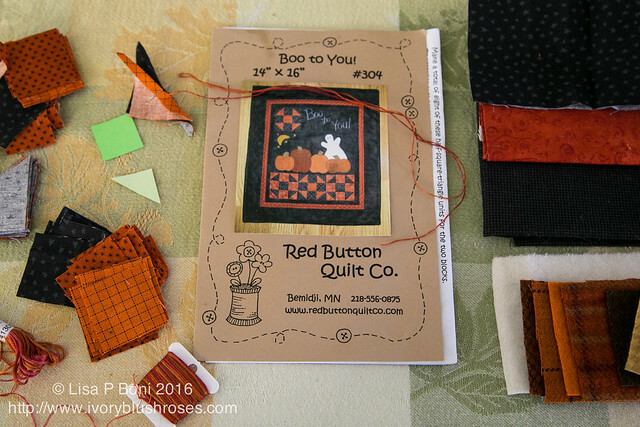 That orange carries over to a small stitching project I am working on. While I don't usually stitch from a kit, I found this one a year or more ago, and am having fun doing some seasonal stitching, though I didn't get it done in time for Halloween. It's getting the "Lisa" touch however and won't be quite what the designer intended. 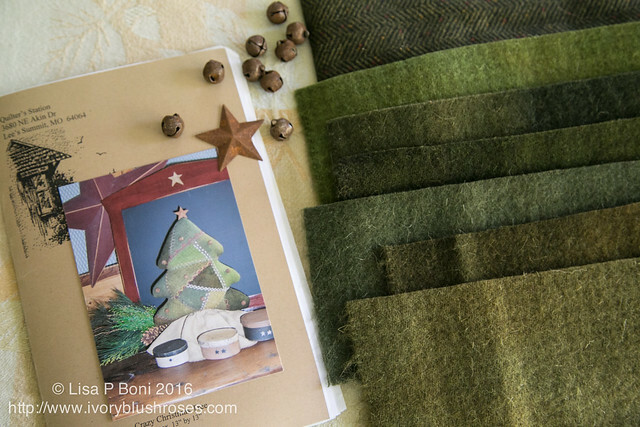 Another kit that I hope to finish before Christmas is this wool kit from Quilter's Station in Missouri. It too will get my own touch and won't have quite such a primitive appearance when finished! 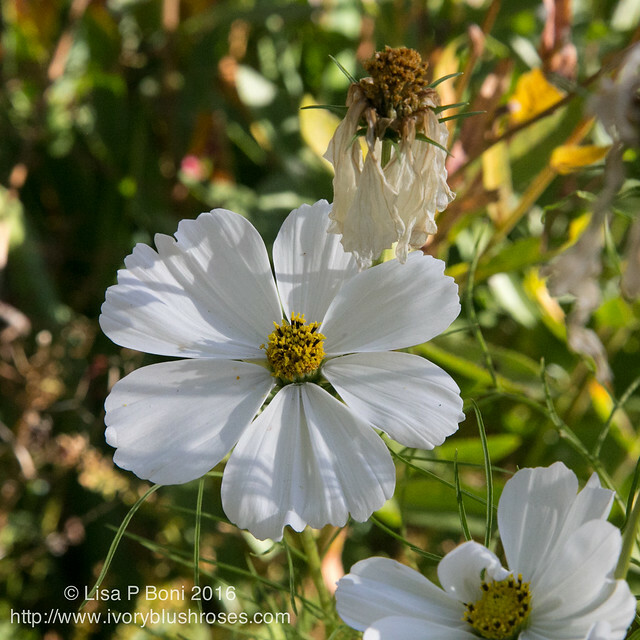 I always enjoy seeing your garden walks--and look forward to the Lisa touch on the kits! 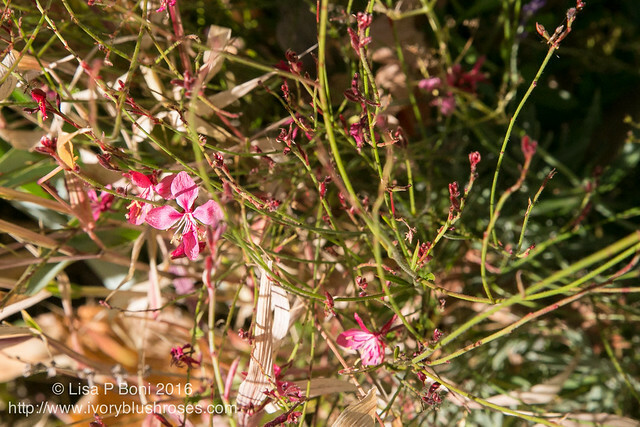 You have quite a bit of color and beauty in your fall gardens. I look forward to seeing how you tweak these two kits. Your work is always lovely.